The summary police report of the Stonewall Resistance dated “Saturday, June 28, 1969 5 am," calls it an "Unusual Occ[urrence]." In the listing of numbers of patrolpersons injured "3" is crossed out and "4" added. This transcription by David Carter and Jonathan Ned Katz follows line breaks in original document. there were 4 Police officers injured. [blacked out] of [blacked out] NYC. 4) Ptl [blacked out] Colquhosen [?] #13605-6 Pct. 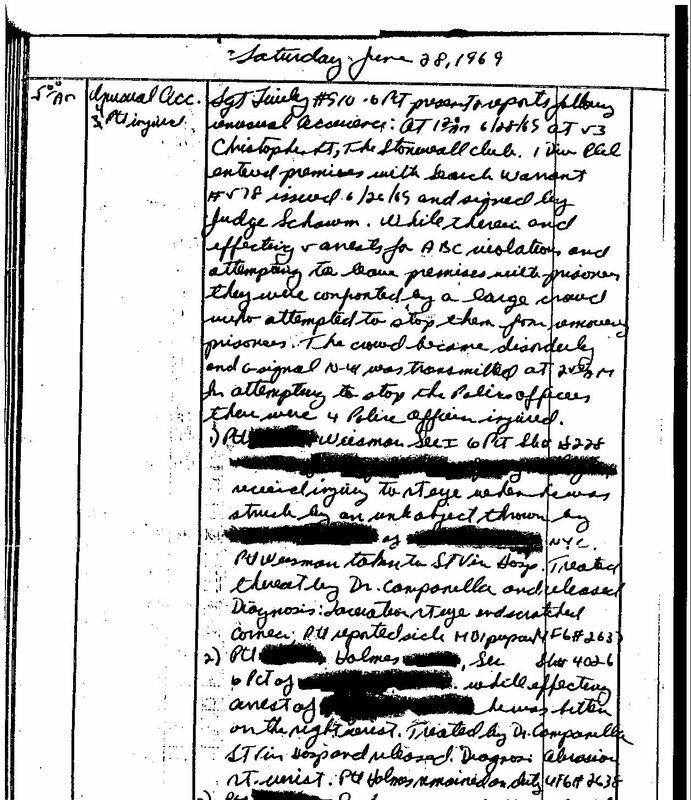 This reproduction of the original police report is made from a copy received by the late Michael Scherker as the result of a Freedom of Information Law request, and is in the Scherker Collection, Division of Rare and Manuscript Collections, Cornell University Library. This document, in the public domain, is reproduced courtesy of that Library. Jonathan Ned Katz retrieved the document from Cornell, and he and David Carter collaborated on the transcription which is copyright (c) by Carter and Katz 2009. All rights reserved. Signal 10-41 was a call for help to the Tactical Patrol Force, a highly trained, riot-control unit of the New York City Police Department that wore helmets with visors and carried assorted weapons, including billy clubs and tear gas. See: Carter, Stonewall, 173,192-93. Stonewall police reports listed on OutHistory as Documents 4 and 5 indicate that Officer Scheu arrested Wolfgang Podolski, so it is Podolski who probably lived in Brooklyn.